Memoria begins with a riddle, and that riddle expands into an enthralling mystery that tells a story which spans centuries. 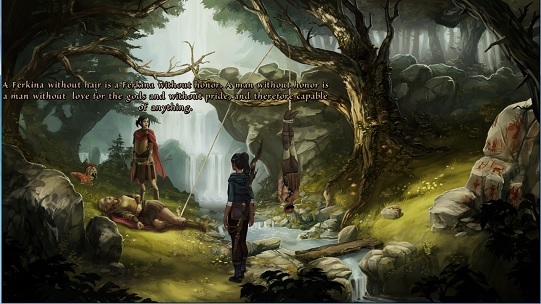 As a point-and-click adventure that takes few chances, its gameplay offers inconsistent quality. However, the story is top notch. So, even though you will find that the game suffers from the traditional flaws of an adventure game, it is worth experiencing for its unpredictable tale, told in a rich, unique world. Memoria, known fully as The Dark Eye: Memoria, is a sequel to the 2011 adventure game The Dark Eye: Chains of Satinav, and it is based upon the popular German pen and paper role playing game The Dark Eye. Therein lies probably the biggest barrier to entry for this game – if you are unfamiliar with the setting and you didn’t play Chains of Satinav, then you may find yourself overwhelmed at the beginning. The story picks up right where its predecessor left off with little to no exposition. The world’s current events are constantly referenced, as if you are supposed to be up to date on them. The world’s history is talked about as if you have already learned it. It can be confusing at times, like picking up a fantasy novel and starting to read it at its halfway point. Since it is easy to stumble onto this game without knowing its background, I can foresee a lot of confused players of this game. If you are just discovering this game, playing Chains of Satinav first is highly recommended. Memoria tells two tales separated by 500 years, but woven together in an interesting manner. The game begins with Geron, hero of Chains of Satinav, seeking out a merchant who promises to cast a spell that Geron desperately needs. In return, the merchant tasks Geron with solving a riddle: “As the stone rules over the scarab, so rules the scarab over the stone”. This riddle is somehow related to the story of Sadja, a princess from 500 years ago who once aspired to be a hero in a great war against demons. Geron begins dreaming of Sadja’s tale, and the story then goes back and forth between the two characters’ adventures. After a long, twist-filled journey, the two storylines come together at the end with a satisfying conclusion. Although it has its dry spots, the story is wholly unpredictable. Since The Dark Eye brings its own brand of fiction to the table, the game is devoid of dull, stereotypical characters or formulaic storytelling. There is virtually no point at which you can predict what will happen next. Information overload may have you scratching your head at times, but the story is otherwise the game’s star attraction. It should be good enough to keep you playing through a game whose execution is otherwise average. Memoria likely won’t change it. Memoria, like most games in the genre nowadays, features production values that are clearly the result of a modest budget. Like a lot of its brethren though, it gets the most out of its graphics with some quality art work and colorful environments. The gameplay bogs down in some spots, but Memoria never gets boring with the way that it looks. There is a wide variety of environments, beasts, and characters to match the rich fiction of the Dark Eye universe. Thanks to this variety, Memoria can communicate its setting through its visuals. Geron’s environments look relatively dirty and realistic, whereas Sadja’s environments look more exotic and magical. The game stumbles a bit when things go in motion though. Animations are crude and ugly for pretty much everything that the characters do in the game. On top of that issue, the voice acting also reflects the strain of a small budget. The most important characters’ voices are done well, but most of the ancillary characters are voiced quite poorly, with some of those performances being downright painful to listen to. It is refreshing to play an adventure game that offers up a creative science fiction story while providing an optimal amount of challenge. You might enjoy the time that you spend with Violett, but you should approach it with modest expectations and a good deal of patience.